Semtech is a founding member of the LoRa Alliance, an organization which has grown to more than 500 companies since its inception in March 2015. The LoRa Alliance is committed to the vision of an open standard for low power, carrier-grade Internet of Things (IoT) connectivity and an open business model, ensuring interoperability and roaming between networks on a global scale. Goals include driving the adoption of the LoRaWAN open protocol and promoting the success of all members. Members come together from around the world to address and represent all aspects of the LoRaWAN-based ecosystem. Members include multi-national telecommunication companies, equipment manufacturers, sensor manufacturers and semiconductor companies. All over the world, members develop, deploy and use the technology across countries and continents, driving the implementation of IoT. A founding member of the LoRa Alliance, Senet, is a leading provider of LoRaWAN-based networks and owns and operates the largest public, carrier-grade LoRaWAN-based network in North America. Senet is accelerating the commercialization of LoRa-based applications and devices through partnership with hundreds of businesses to revolutionize their products and operations with the IoT. Two of Senet’s successful networking use cases have already been covered in the Semtech’s blog, Inside Out. Read about unique flood detection and irrigation conservation use cases. 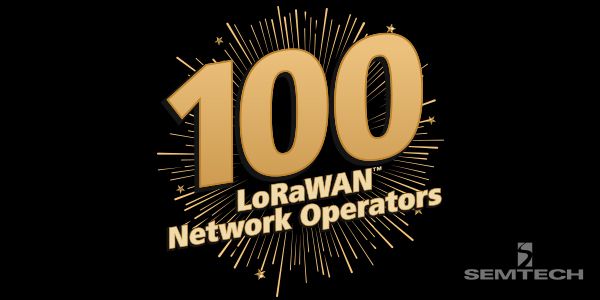 One hundred network operators is an important milestone, and the LoRa Alliance’s growth will not stop there. LoRa Technology’s adoption is expected to continue in 2019, as we anticipate several thousand total gateways will be deployed worldwide, enabling tens of millions of end nodes. LoRaWAN-based networks will account for more than 40% of all low power wide area network (LPWAN) connections worldwide, creating solutions for everything from crop irrigation on the farm, to preventing illegal parking in our busiest cities. By 2022, experts anticipate there will be 500 thousand total LoRaWAN-based networks, leading an LPWAN market projected to be worth approximately $56 billion. The possibilities on LoRaWAN are truly limitless. To learn more about the LoRa Alliance and the organizations behind LoRa Technology’s success, visit our website. Visit the LoRa Alliance’s website to learn more about the LoRaWAN open specification and how to join.